Thirteen-year-old Clare Silver's world has been turned upside down: her mother recently passed away and her father moved them to Malawi so that he could work as a doctor for Global Health Project. Even on the other side of the world, her worries remain the same: will she fit in with her classmates? What will her life be like without her mother? How long does grief last? I do some of my best reading at the salon, and was actually able to whip through Laugh with the Moon in one sitting, completely immersed in Clare's life in Malawi. 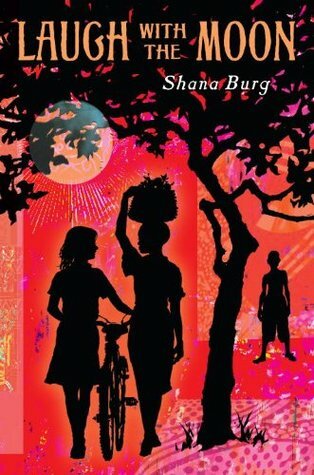 Author Shana Burg has experience in this country, and it shows, from the language snippets, the daily life, and the cultural aspects. I loved all of the details, from the characters' names (Memory, Innocent, Special, Lovemore) to the cheese straws that are actually bugs. Burg is a beautiful writer; I am eager to read more of her work. There are many sentences that I want to share with my students, such as "My heart is a hive of stinging bees...The bees fly out, dripping honey everywhere." I will be recommending Laugh with the Moon widely and frequently.